At the recent ISC West 2014 conference Bosch Security Systems, Inc. displayed a number of new devices that are taking security to the next level. Both video security and other security including access control systems and home automation were featured, all of which equipped with the latest features, designed to benefit integrators and end-users alike. We’ve written much on our blog on the benefits of IP video, video management systems, and digital video storage, and Bosch is moving forward on all fronts with innovative products. One of their most interesting new concepts is Dynamic Image Noise Reduction. The idea here is that there is often little movement in a scene, and sometimes there is movement that is not relevant from a security standpoint. A flag waving in the breeze for example. Dynamic Image Noise Reduction recognizes what is and is not relevant, and adjusts the bit rate at which the video is recorded accordingly. Idle scene=a lower bit rate=less storage space required. This optimizes storage space by recording at a higher bit rate (which means better image quality) only when there is a relevant issue in the scene. Other new video security items of interest from Bosch include a new camera with 4k ultra HD resolution for superior image quality. Bosch also displayed its starlight HD cameras which outperform others in low-light situations and feature “superior light sensitivity, wide dynamic range, high resolution and the ability to capture fast moving objects.” Bosch’s Dynamic Transcoding technology allows for improved streaming of live video in situations where network connections are limited, and the DIVAR IP 2000 storage provides the end-user with a storage unit that is truly plug and play. 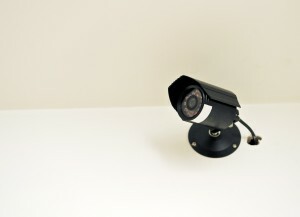 More advanced security items of note include intelligent video detection, which notifies users of suspicious activity with video clips directly via email. The new access control system B942 keypad senses the presence of a user and turns on the display when they approach. In addition, new cloud-based services will give users access to their control panels from their smart phone at home via the Remote Security control app, best of all, without having to configure their home network. This entry was posted on Thursday, April 10th, 2014 at 1:36 pm. Both comments and pings are currently closed.